(Nanowerk News) Astronomers at The University of Texas at Austin and Harvard University have put a basic principle of black holes to the test, showing that matter completely vanishes when pulled in. Their results (Monthly Notices of the Royal Astronomical Society, "Stellar disruption events support the existence of the black hole event horizon") constitute another successful test for Albert Einstein's General Theory of Relativity. Most scientists agree that black holes, cosmic entities of such great gravity that nothing can escape their grip, are surrounded by a so-called event horizon. Once matter or energy gets close enough to the black hole, it cannot escape -- it will be pulled in. Though widely believed, the existence of event horizons has not been proved. "Our whole point here is to turn this idea of an event horizon into an experimental science, and find out if event horizons really do exist or not," said Pawan Kumar, a professor of astrophysics at The University of Texas at Austin. Supermassive black holes are thought to lie at the heart of almost all galaxies. But some theorists suggest that there's something else there instead -- not a black hole, but an even stranger supermassive object that has somehow managed to avoid gravitational collapse to a singularity surrounded by an event horizon. The idea is based on modified theories of General Relativity, Einstein's theory of gravity. While a singularity has no surface area, the noncollapsed object would have a hard surface. So material being pulled closer -- a star, for instance -- would not actually fall into a black hole, but hit this hard surface and be destroyed. "Our motive is not so much to establish that there is a hard surface," Kumar said, "but to push the boundary of knowledge and find concrete evidence that really, there is an event horizon around black holes." The team figured out what a telescope would see when a star hit the hard surface of a supermassive object at the center of a nearby galaxy: The star's gas would envelope the object, shining for months, perhaps even years. 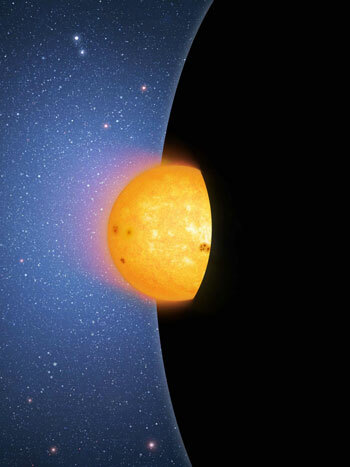 "We estimated the rate of stars falling onto supermassive black holes," Lu said. "Nearly every galaxy has one. We only considered the most massive ones, which weigh about 100 million solar masses or more. There are about a million of them within a few billion light-years of Earth." They then searched a recent archive of telescope observations. Pan-STARRS, a 1.8-meter telescope in Hawaii, recently completed a project to survey half of the northern hemisphere sky. The telescope scanned the area repeatedly during a period of 3.5 years, looking for "transients" -- things that glow for a while and then fade. Their goal was to find transients with the expected light signature of a star falling toward a supermassive object and hitting a hard surface. "Given the rate of stars falling onto black holes and the number density of black holes in the nearby universe, we calculated how many such transients Pan-STARRS should have detected over a period of operation of 3.5 years. It turns out it should have detected more than 10 of them, if the hard-surface theory is true," Lu said. "Our work implies that some, and perhaps all, black holes have event horizons and that material really does disappear from the observable universe when pulled into these exotic objects, as we've expected for decades," Narayan said. "General Relativity has passed another critical test." Now the team is proposing to improve the test with an even larger telescope: the 8.4-meter Large Synoptic Survey Telescope (LSST, now under construction in Chile). Like Pan-STARRS, LSST will make repeated surveys of the sky over time, revealing transients -- but with much greater sensitivity.